At Aspect, we get hundreds of calls from people who need toilet plumbing jobs done in their properties. Toilet repair isn’t a job for the faint hearted though; whether it’s an issue with the flush or a problem with a leaking tank, lots of things can go wrong and it’s important to be able to pinpoint the problem if you need to call a plumber. Here are just some of the plumbing issues you might experience with a toilet. There should not be a constant sound of running water coming from your toilet, or water running down the toilet bowl a long time after flushing. If there is, a toilet plumbing expert will tell you that you have a problem with leakage. Very often, high water pressure is at the root of the problem. Your plumber will look into this before attempting any toilet repair work. One of the most undesirable toilet repair issues, a blocked toilet can cause an overflow and in the worst case scenario, it could flood your bathroom with unclean water from the toilet. The causes of such blockages can be either due to the materials being flushed down the toilet, or because of an inadequate flushing mechanism. Minor blockages can often be alleviated with a plunger, but if it’s something more substantial, someone with experience in toilet plumbing will need to investigate, as the problem might be located in the pipe work or drainage system. 1. When you flush, it pulls a lever on the inside of the tank – is this broken? Either the rod which the lever pulls on is broken or it has become unhooked from the lever itself. 2. Look at the plastic diaphragm (also known as the fill valve or the Ballcock valve) – is it split? Does it successfully lift water when you flush? 3. Examine the float ball to see if it’s either waterlogged, or it is being obstructed by other parts of the toilet. These are some simple ways to diagnose minor toilet plumbing issues, but if any significant repairs or replacements need to be carried out, it’s always best to consult a professional. 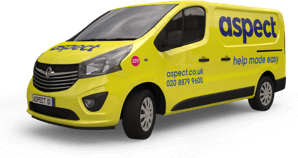 At Aspect, we have a fully qualified team of toilet repair technicians who can spot and treat all types of toilet related problems for you.